Palestine Stadium in Gaza City was bombed by the Israeli airforce last month during a conflict with the territory’s ruling Hamas party. (CNN) — A group of soccer stars have called for Israel to be stripped of hosting rights for a top European age-grade tournament next year following last month’s bomb attacks on Gaza. More than 60 players including Didier Drogba, Eden Hazard, Papiss Cisse and Demba Ba signed a petition which was posted on the website of former English Premier League and Spanish La Liga striker Fredi Kanoute. “We, as European football players, express our solidarity with the people of Gaza who are living under siege and denied basic human dignity and freedom,” the statement said. It cited reports of a bomb attack by Israeli forces on a football stadium in Gaza on November 10, which killed four teenage players, and said that two players from the club Al Amari had been detained in Israel “without charge or trial” since February. “It is unacceptable that children are killed while they play football. Israel hosting the UEFA Under-21 European Championship, in these circumstances, will be seen as a reward for actions that are contrary to sporting values,” the statement said. Tel Aviv will host the European Under-21 Championship next June, when eight nations will compete in Israel. European football’s governing body UEFA has already rejected calls to move the tournament from pro-Palestine groups including the disputed territory’s football association. “UEFA is an apolitical organization and (Israel) earned the right to host this competition through a fair, democratic vote,” UEFA president Michel Platini said in June. 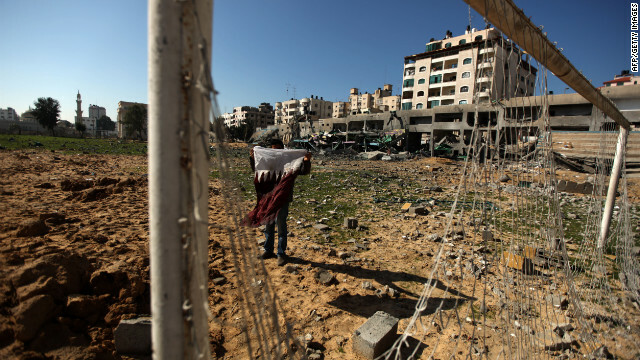 World football’s governing body FIFA also says it does not interfere in countries’ political affairs, but said it would help rebuild the stadium in Gaza — as it did in 2006 following a similar attack. “We see it our mandate to rebuild football infrastructure which has been destroyed,” FIFA secretary general Jerome Valcke said last week. Valcke’s statement was criticized by Israeli media, which reported that the stadium was used by Hamas militants to fire rockets at Jerusalem and Tel Aviv. Palestine’s bid for recognition was boosted last week when the U.N. general assembly voted to upgrade its status to that of a non-member observer state — a move which was opposed by Israel and the U.S.
“We came to the United Nations not to confront the U.S. and not to isolate Israel or to discriminate Israel. We came to preserve the two-state solution,” Chief Palestinian Negotiator Saeb Erakat told CNN’s Piers Morgan.